Through the generosity of individuals, businesses and estates, each year new artifacts are added to the permanent collection. These donations assist the Geneva History Museum to collect, preserve and exhibit significant materials to share Geneva’s story with future generations. The Archive Reading Room, located in the lower level of the museum, provides an excellent environment for researchers interested in Geneva history. With staff assistance, visitors can access thousands of documents, photographs, maps, and reference materials to research family genealogy, building/property information and businesses. Research is available by appointment only after an online Research Request Form is submitted or a paper Form is sent via Email to curator@genevahistorymuseum.org or dropped off at the Museum. You will be contacted within two weeks with a list of possible holdings pertaining to your search. The Geneva History Museum holds an extensive array of historic photographs pertaining to Geneva including buildings, people and places. Photographic reprints are available for purchase in both our Gift Shop and by special order. All image requests must be in writing, please complete a Research Request Form to indicate detailed information about the subject or location of the photograph you are requesting. Reproductions are provided under license agreement for purposes as indicated in writing by the user and agreed upon by the museum. Refer to our Image Reproduction Fees. If you have an item, photograph or document that you believe would enhance the Geneva History Museum collection, please bring it to the Museum along with a completed Artifact Donation Form including a description of your proposed donation. If the item is unable to be dropped off for review, please include a photograph and measurements. 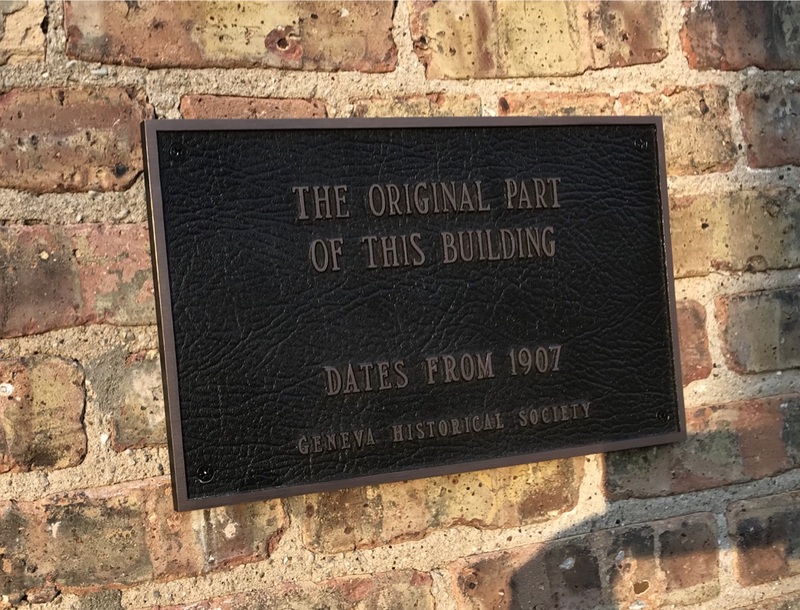 The Geneva History Museum (Geneva Historical Society) offers property owners the opportunity to unveil the unique history of their building or home. Our Museum archives contain many resources to provide comprehensive research for the community. The Museum has awarded Bronze Plaques to properties since 1948 as a private recognition through our organization with no affiliation with the city's designation of the historic district. The plaque simply serves as an honorary recognition of the history of the structure. Domestic structures must have remained in appearance essentially as built. Commercial and/or civic structures must substantially retain their original form and appearance.